Human Resources, really a Vital function? HR is fighting a battle for its relevance in tomorrow’s organisation. If it wants to become something more than just an entity dealing with compliance and payroll administration, a serious paradigm shift is needed. Large HR Transformation efforts, based on the so-called Ulrich Model, have tried to bring efficiency into HR organisation, trying also to integrate technology and process automation. But their results have to a large extent failed to reach their goals. Even with the introduction of the so-called HR Business Partner role, in many organisation the satisfaction of business management towards the HR organisation has swiftly declined. The effort of regaining a business relevance by trying to impose a Business agenda through Talent Management, is also failing because it is proving to be the “wrong” answer to the problem. Facing a structural problem one would argue that a structural change would be necessary, not just a simple make-up effort. Is there a solution then? In my opinion yes, and the success that many professionals in this domain endeavor every day shows that a lot can be achieved. What is key is accepting the inevitable rethinking of HR as a whole, starting from its role, its key competencies and the related responsibilities within the organisation. The first thing I suggest is abandoning the word “HR”. The concept of Human Resources was meant to stress the changing role of this function when “Corporations began viewing employees as assets rather than as cogs in a machine“. Good principle… but it just failed to miss the point, and the word HR (similarly to word “Talent”) has simply become a symbol of “political correctness”, expressing nothing more than a blunt aspiration in most cases. The concept of Human Resources was born an idea that employees should not be treated as mere “costs” anymore, but as key resources within the organisation. That’s why over the years also the world Human Capital has been actively used. I do not argue on the relevance of both concepts, but I believe that in the midst of one of the biggest crisis of Capitalism ever, where the “financial capital” system is showing day after day how it has been failing to support real growth, we have the change to underline the real element we should be taking care of: People. It already came to the attention of many that a relevant player like Google has named its function “People Operations“. I prefer the wording People Management for a very simple reason, in many non english contexts the word “operations” simply feels too “operative”, not carrying the real meaning it has in the English dictionary. Plus there is also another key issue. Following Ulrich’s teachings, most organisations have been pushing a lot of people management activities towards line managers. Results have been not always the expected ones. Although I truly believe that “people management” has such is a key duty of every Manager, most of today’s managers are simply “un-equipped” to perform this task successfully. Why? Well often because HR has never supported them enough to take this role, closed in between shortages in management capabilities and over complicated processes. Which leads to the first underlying assumption of my thought of a “new paradigm for HR”: simplicity. Setting the new foundations: engage with Simplicity. Isn’t that what any average HR director has tried to do? And this has especially become true after the HR Transformation process. With the implementation of HR Business Partner role and the push of a lot of People Management activities towards the manager, there has been a strong misconception that the only way to keep HR to make it relevant was to make it more “complex”. After all if you can demonstrate it is complex, you can satisfy the justification for its need. So, the so called “Center of Expertise” of the HR organisation (another element of Urlich’s Model) have soon become sources of complication. I believe that the real added value that the new People Management can offer is instead support to management through simple and understandable tools. And if you believe that simplicity cannot be achieved you are already giving up on the possibility to engage in this necessary Paradigm Shift. The key driver to ensure our relevance is not to demonstrate how complex managing people is, but to show off how simple it can become with the appropriate tools and support. The new paradigm I am suggesting is not going to alter the basic processes for which we should be accountable. People Management is still going to be about Attracting, Developing and Retaining people within the organisation. What I would like to suggest is an underlying framework, which, of course, needs to be simple and understandable by everybody. Short. Straight to the point. Underlying the key element of the new People Management paradigm: development of a Culture that is “winning” for the company, i.e. aligned with its business strategy. Second element that we need is a Mission for People Management. Again, it needs to be easy. Develop innovation and creativity, by mean of simple tools and processes supporting people actions within the organisation. See? Easy. We have already talked about the impact we should be having on Innovation and Creativity. What we need to add is the focus on simplicity of tools and processes. I somehow would be tempted also to drop the word “processes”, but that would probably be too much still. And the key element to be achieved is the continuous support of actions performed by all the people within the organisation. One would argue, why not characterizing the word “actions” with some adjective. Nope, I prefer to keep it short. Because the relevance of those actions is a business duty in my opinion, because what People Management needs to offer is a framework for people to express their potential. And this framework is constituted by the culture mentioned in the Vision. The new People Management paradigm: a new model. The new model I am suggesting is pretty easy also to represent. The concepts of Simplicity, Creativity and Innovation are the real “weapon” for the new People Management organisation to be able to reach the Winning Culture the business needs. And all this, supported by tools and processes in the four traditional areas of Attraction, Development, Retention and Review. This is the only area we haven not fully explored yet, and that I wish to briefly touch before concluding this article. We have briefly touched the key role that HR analytics should be playing in the new organisation. One of the key trends for the future is how HR will be able to cope with “Big Data“. Which means that People Managers will have to cope with something they are not really keen to: crunching numbers. The issue is that most people forget about the fact that HR is (or should be) a source of data and intelligence. And no, I’m not talking about payroll or labor costs. I’m talking of Real Time Performance Management for example. For sure analytics is going to change the way HR works, and it needs to be a key support element of the new People Management Paradigm I am suggesting. The issue is that we should not move too fast. Most of today’s HR departments are still struggling with their Excel spreadsheets. For sure Big Data can be the answer, but what is the question? That is why analytics need to be placed as part of the People Management process map. They need to be important and relevant as attraction or development. And they need to be linked to an essential function of each business process, review. HR has never been good at reviewing itself. Hiding behind the “soft touch” of its contribution to the organisation, it refused to “measure” itself in many ways. And were measures have been done, they have been limited to some activities and only in terms of ROI. For sure we can start thinking of predictive algorithms. But I don’t think this is the real priority. We need to help business understand not just the tip of the iceberg, but its real size. Performance Management = Performance Appraisal. How wrong! The Performance Appraisal form is for sure a tool that can help to Performance Management. But… how effective is a yearly evaluation (as this is the average time today) in a business were the speed of change is measured in days? Performance Management should move from a periodic process into a real-time activity. Managers should have a tool set at hand helping them with constant feedbacks to their employees. And the People Manager should be able to support any given choice by a strong analytics set capable of supporting considerations over business results in terms of performance, competencies and motivation. If this gets in place (and does not need to be complicate, an easy and simple live dashboard can make the trick), the Business will really love you. Because that is what they have been regularly asking for ages now! I have mentioned how important it is for People Management to become the active developer of the company’s culture. This task hides a really complex effort in the back, and should not be underestimated. I’m especially keen in recognizing that many HR professionals today are not equipped to cope with culture development. Something that can be easily checked by monitoring the “importance” of (culture) change programs into many organisation. All organisations need stability and change, tradition and innovation, public and private interest, planning and laissez-faire, order and freedom, growth and decay. The consequence is that the systems and processes of HR are changing to the world of dilemmas created by the customised workplace and even more by globalisation. Increasingly, in this new paradigm contrasting values have to be integrated. A challenging role this of integration of dilemmas. However, this is what Kuhn referred when talking about “scientific paradigms”, as a new Paradigm gets created when it is capable of encompassing the dilemmas related to the previous one. However, leaving the theory of scientific revolutions aside for a second, three key elements are necessary for People Management to make this integration paradigm true: Recognition, Respect, Reconciliation. Recognition: whilst it is easy to recognise overt and explicit cultural differences, way too often we do not consider the hidden implicit differences. Years of application of US born HR approaches with mixed results in the rest of the world have shown the importance of being able to run a real “cultural due-diligence” within your organisation. The first step is in fact to be able to recognise that there are differences in values and thus the meaning given to the same thing by different people. Respect: different orientation on meanings given to different things cannot be “right” or “wrong”. They are just different. It is all too easy to be judgmental about people and societies that give different meaning to their world from ours. Thus the next step is to respect these differences and accept the right of employees (as well as customers) to interpret the world (and our products and services, but also the management tools and processes we put in place) in the way they choose. Reconciliation: because of these different views of the world, we have tensions deriving from these different value systems and/or current practice versus idealised behaviours. The task of the HR professional is to facilitate the reconciliation between these opposing differences in the area of their own function and to help build the wider reconciling organisation. I truly believe this concept is so powerful, that its effects can only be imagined. Well, some organisations really active on Diversity Management, for example, have shown how important this understanding and this reconciliation effort is for an organisation. But what we are saying here is one step more advanced. The People Manager needs to become and advocate of the organizational reconciliation, between competing objectives, different value systems, opposing interests and moving targets. How? Composing a culture that can become truly “winning” by enlarging the area of overlap between the personal values of the people within the organisation and the values of the business as a whole. This is the real challenge for the new People Management paradigm. A good challenge for the years to come. I am an experienced and innovative HR professional dedicated in improving the way organizations achieve results through their people. Over the years I have worked on many projects in different HR domains, gaining a deep understanding of all key HR processes, from Talent Management to Recruiting, from Organizational Design to Leadership Development, from HR Transformation to HR & Payroll Systems implementation at International level. Working with Fashion Brands, leading retailer as well as, through consulting, international brands in industries like Banking, Manufacturing, Professional Services at both Headquarter and local level. Last but not least I consider myself an eclectic and creative personality, with many interests ranging from technology to arts and poetry. Great view Sergio! 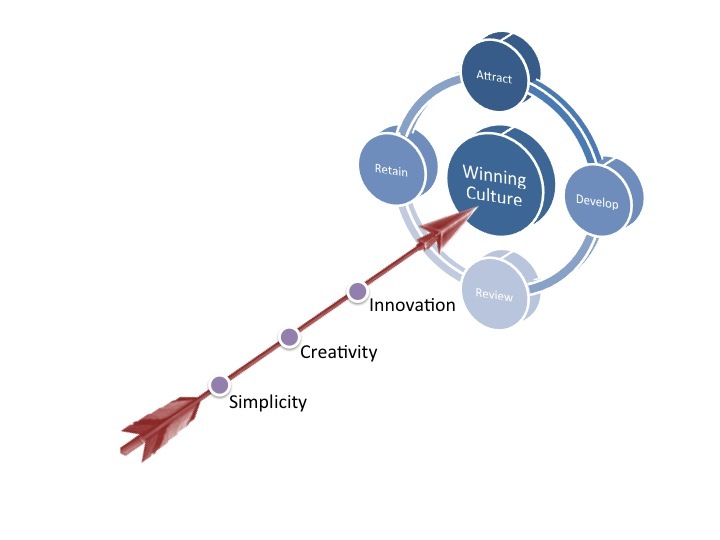 I like specially the role of simplicity, as expressed by the proposed mission – create a winning culture is an ambitious goal that only daring professionals would face. About changing the name of HR, I think it is good for “setting the pace”, but I am more skeptical with that (know a lot of companies that did only on paper, but still operated as the complication factor). So I wouldn’t mind sticking with HR, ensuring that we are able to hire ambitious people that strive to do their best (a real challenge in the field, you may agree… 🙂 ). Again, excellent article, excellent proposition and food for thought, thank you for sharing! I agree, the issue with the word HR is more a provokation. However, some time to “set the pace” you need to break with the past. And I believe this also talks to the concept of “simplicity”. I agree that hiring ambitious people is not an easy job. Nothing around People is “easy”. But the good answer is not making it even more complex.